Yesterday I took the oath of office as the Texas State Historian at the Capitol in Austin. Lieutenant Governor David Dewhurst administered the oath in ceremonies that also included remarks by Larry McNeill, a former President of the Texas State Historical Association, Dr. Frank de la Teja, outgoing Texas State Historian, and State Representative Larry Phillips. John Crain, a commissioner of the Texas Historical Commission and a former President of the Texas State Historical Association, served as master of ceremonies. Kent Calder and Steve Cure represented the Texas State Historical Association. Larry Oaks, Mark Wolfe, and Terry Colley attended on behalf of the Texas Historical Commission, which co-sponsored the event along with the Texas State Historical Association. Michael Gillette, Executive Director of Humanities Texas, represented that organization. The audience included various other individuals interested in the history and heritage of Texas, along with members of the Capitol press corps. A group of friends and colleagues surprised me yesterday evening with an old-fashioned, West Texas-style party filled with picking, grinning, and eating to celebrate my being named Texas State Historian. The highlight of the evening was a performance by the “Western Band With No Name” led by my friend Hunt Tooley from Vernon, Texas. Although he is an historian with an international reputation because of the shelf-full of books he has written, Hunt is probably the most talented musician to come out of Wilbarger County since Jack Teagarden. Another friend, and current Austin College dean, Patrick Duffey made some very nice remarks about me and my teaching of Texas history. Very much appreciated. Over the last several weeks, I have participated in several events related to the appreciation and study of early Texas Art. During the first weekend of this month, I attended the annual meeting of CASETA, the Center for the Advancement of Early Texas Art. This annual meeting attracts scholars, art historians, artists, and art collectors for several days of meetings, papers, and presentations. A sale featuring early Texas art operates concurrently with the symposium. This year’s meeting in Austin featured presentations by a talented group of scholars and collectors that included Ted Pillsbury, Sam Ratcliff, Ellen Niewyk, Francine Carraro, Bonnie Campbell, J. P. Bryan and others, all of whom examined a wide spectrum of themes dealing with early Texas art. The following week I delivered a talk entitled “Creating Texas Regionalism” to an enthusiastic audience at the Heard-Craig Center for the Arts in McKinney . My talk, as seen at the right, surveyed the regional movement of the 1930s across the spectrum of Texas literature, architecture, art, and sculpture, linking together the regional viewpoints of writers, architects, and artists including J. Frank Dobie, David R. Williams, O’Neil Ford, Walter P. Webb, Jerry Bywaters, and others. 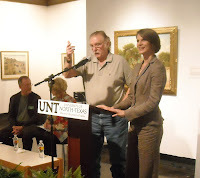 Yesterday, I attended a gallery talk given by A. C. “Ace” Cook, one of the state’s most enthusiasti c collectors of Texas Art. (At left, Ace Cook is being introduced.) The University of North Texas Art Gallery has opened an exhibition of from his Hoc Shop Collection, which is usually on display at his Ice Cream Parlor, the Bull Ring, in the Stockyards Section of Fort Worth. Over recent decades, Cook has assembled one of the most interesting collections of early Texas art that is currently in private hands. Today Governor Rick Perry appointed me to be the next Texas State Historian as successor to Professor Jesus de la Teja, who currently holds that post. I will be sworn into that office at a date to be determined in the near future. This appointment is a non-political, completely non-partisan position that recognizes a Texas historian and charges that person with furthering and enhancing the study of Texas history. Hence, I will continue all of my duties as a professor here at Austin College while I serve in this office, which has a two year term.The occupant of this office is charged with enhancing Texans’ knowledge about the state’s history and heritage; encouraging the teaching of Texas history in public schools; and consulting with state officials on the promotion of Texas history. This will involve my speaking at a number of places and making appearances where Texas history is being featured. An Austin College Press Release: May 1, 2009 -- SHERMAN, TEXAS -- Austin College History Professor Light Cummins and student film-maker Austin Tooley, a senior from Sherman, will present their recent projects on the life of Emily Austin, sister of Stephen F. Austin, on Thursday, May 7, at 11 a.m. in Hoxie Thompson Auditorium of Sherman Hall. The session is free and open to the public. The event will feature short talks by Cummins and Tooley, and autographed copies of the book and DVDs of the film will be available for purchase. The Austin College Department of History and the Center for Southwestern and Mexican Studies sponsor this session. Cummins, Guy M. Bryan, Jr., Chair of American History, has written a biography of Emily Austin, who lived from 1795 to 1851. This new book, Emily Austin of Texas, 1795-1851, was published in April by the TCU Press as part of its Texas Biography Series. Emily, the daughter of Moses Austin and the sister of Stephen F. Austin, was married twice, first to James Bryan and after his death, to James F. Perry. The Perrys settled Peach Point Plantation on the Texas Coast. In 1840, Emily Austin Perry gave the Reverend Daniel Baker the first financial donation to what would become Austin College in memory of her brother Stephen and was acknowledged with the naming of the college. Emi ly Austin Perry became one of the most prominent women in pre-Civil War Texas and was a successful plantation mistress, a consummate hostess, and an astute businesswoman. Cummins details her life in his new book. Austin Tooley has just completed a 30-minute documentary film dealing with the life of Emily Austin, based on Cummins’ new book. Titled Emily Austin: Sister to an Empire, the film was undertaken as Tooley’s senior honors project and was sponsored by the Erwin E. Smith Foundation and the Andrew Mellon Foundation. Tooley filmed interviews with prominent historians who have written on Texas history and also interviewed descendants of Emily Austin during the making of the documentary. Much of the footage was shot on the historic Peach Point Plantation and at other locations associated with the life of Emily Austin.